Patrick O’Donoghue was born in Mourne Abbey, Co Cork, on 4th May 1934, and is the middle of five children [three girls, two boys] of farmers Daniel and Sheila O’Donoghue. He was educated at the Patrician Academy in Mallow, Co Cork. He came to Britain in 1959 for seminary training, first at Campion House, Osterley, Middlesex, then from 1961-67 at Allen Hall seminary when it was at St Edmund’s, Ware, Hertfordshire. He was ordained priest for the Archdiocese of Westminster on 25th May 1967. The Second Vatican Council coincided with his student days as a seminarian, and its spirit and teaching have influenced and directed his ministry through the years. 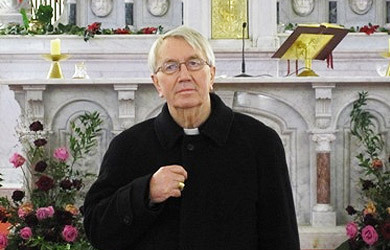 As a newly ordained priest, Fr O’Donoghue worked in the parish of Our Lady of Willesden from 1967-70. He was on the Diocesan Pastoral Mission Team from 1970-73, where he gained experience in 27 parishes in the Archdiocese. From 1973-77 he was Pastoral Director at Allen Hall Seminary in Chelsea. From 1977-78 Fr O’Donoghue was with the team ministry at the parish of St Thomas of Canterbury, Fulham. His varied experience led to the conviction that renewal at every level in the Church was urgently called for, combined with a need to grapple with the new challenges facing the Church, preaching the Gospel in a fast-changing world. Monsignor O’Donoghue was Sub-Administrator of Westminster Cathedral from 1978-85, and Administrator from 1990-93. In between times he was Rector of Allen Hall Seminary from 1985-90. Twenty years spent in the Seminary and at the Cathedral further heightened his desire for change. But there were other challenges too, especially inner-city life with its extraordinary wealth and search for, or absence of, faith, and all too much poverty [street homeless, addicts, dispossessed, young and elderly]. It was necessary, too, for the Church to champion the poor, and to this end he was key to the establishment of The Cardinal Hume and Passage Centres, which continue to flourish in London. Mgr O’Donoghue is a former Chair of the Archdiocese of Westminster Senate of Priests. 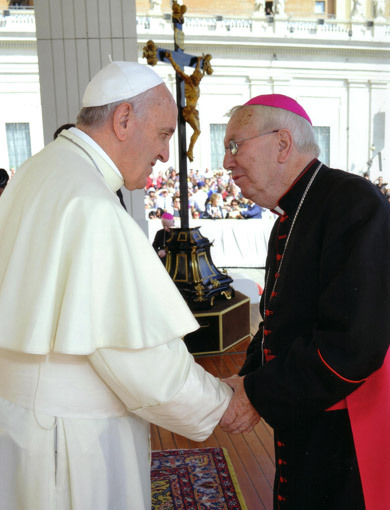 He was ordained as Auxiliary Bishop for the Archdiocese of Westminster by his great friend and mentor Cardinal Basil Hume on 29th June 1993, and was appointed Bishop to the West London Pastoral Area of the Archdiocese. 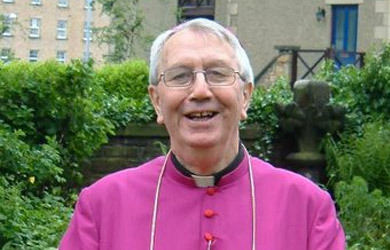 Bishop Patrick served as Chairman of the Westminster Diocesan Pastoral Board from 1996 and Chairman of the English and Welsh Bishops’ Committee for Migrants from 1993. He has been constantly to the fore, not least in the media, in advancing the cause of this most vulnerable section of our community. In May 2001 he launched a strongly-worded document Any Room at the Inn? – Reflections on Asylum Seekers”. He wrote this to mark the 50th anniversary of the UN Refugee Convention, and specifically in the run-up to the General Election. Bishop Patrick was officially Installed as Fifth Bishop of Lancaster at a special Mass in St Peter’s Cathedral, Lancaster on Wednesday 4th July 2001. Archbishop Patrick Kelly, Archbishop of Liverpool, presided. His Eminence Cardinal Cormac Murphy-O’Connor, Archbishop of Westminster, preached at the Mass. In February 2007, Bishop O’Donoghue initiated a time of prayer, review and consultation – Fit for Mission? – of the life and mission of the Diocese in all it aspects – Catholic Education, the Shape and Mission of Parishes, Marriage Preparation, The Permanent Diaconate etc – seeking to strengthen the sacramental and mission life of each area of the Diocese so that this generation, and future generations, can have a rich and living encounter with our Lord Jesus Christ. At the heart of the Fit for Mission? review is the exhortation to recognise our apostolic calling to be a people gathered and sent by our Lord to proclaim the Gospel afresh to our generation with a new-found confidence, especially so in a society that is pushing God to the margins. Having as part of its aims – the re-configuration of parish structures to make the Diocese fit for mission – it is apparent that the future shape and mission of the Diocese will hinge much upon this Review for many years to come. The Fit for Mission? review consultation and its eventual implementation calls for the whole-hearted commitment, energy, and leadership of all the baptised in the Diocese. The now famous Fit for Mission? – Schools (2007) and Fit for Mission? 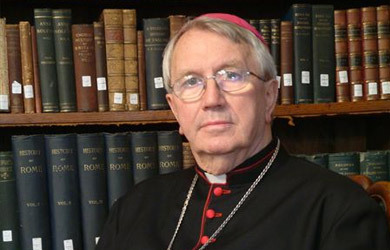 Church (2008) teaching documents from Bishop O’Donoghue have had a phenomenal response across the Diocese, many accolades from the The Holy See, the country and from Catholics all over the world. 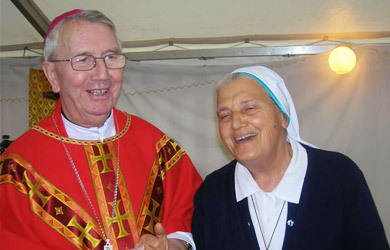 Bishop O’Donoghue retired as Diocesan Bishop on 1 May 2009 and left the Diocese to reside in his native County Cork, Ireland on 29 May 2009. 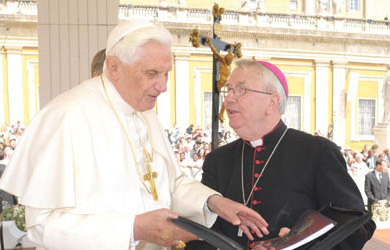 On 3 July 2009 Bishop O’Donoghue was appointed, at his own request, Assistant Priest of the Parish of Bantry – where he ministered with two other priests to 2.5 thousand people at Mass and 9 schools and one hospital. The Bishop Emeritus also assists the Bishop of Cork & Ross with the administration of the Sacrament of Confirmation in and around the Diocese. In August 2012 Bishop O’Donoghue moved from Bantry and was appointed for a brief time as Assistant Priest to Ballincollig Parish in Cork City. In April 2013, Bishop Padraig, as he is known locally, moved to be resident at Nazareth House, Mallow and is now much nearer to his family and relatives.